Your search is over. Finally, a classy, useful gift for yourself or your loved ones! The World's most famous paper cup, replicated in *CERAMIC* for home or restaurant use. The perfect gift for New Yorkers, Ex-New Yorkers, Trip-missers and just anyone else that likes to drink a cup of coffee! 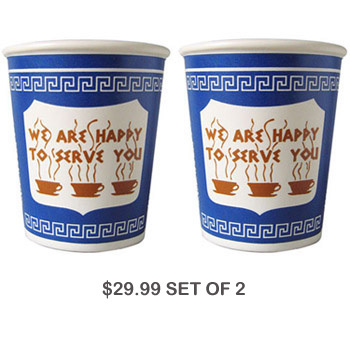 The famous New York City greek paper cup has been around since 1963. Currently, over 180,000,000 per year are carried out of New York delis full of hot coffee! Due to the vast number of them, the length of time they have been around and New Yorkers' appreciation for their design, the cup has come to be a quintessential New York icon. It is very likely the world's most famous coffee cup.